Water – as life giver and as a symbol of purity – is an essential component of religious rituals like baptism and ceremonial cleansing. For a religion that derives its name from a river – Sindhu, from the Indus – water takes on a whole new meaning. 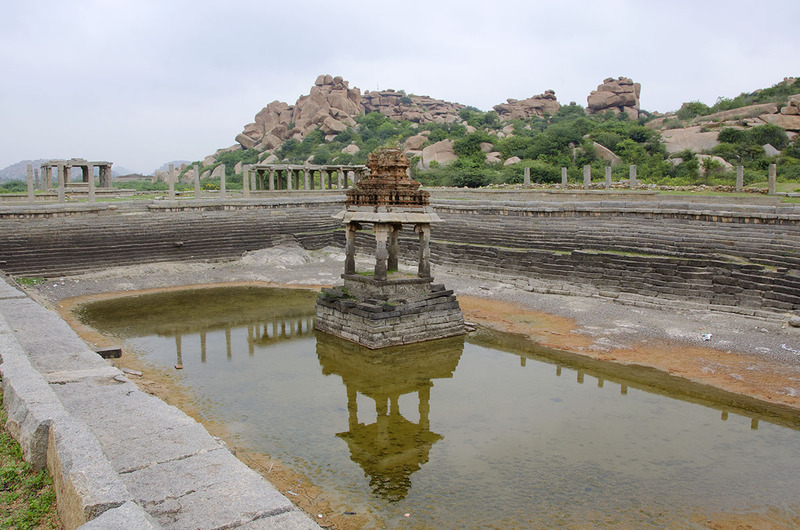 No Hindu temple is complete without a Pushkarini or temple tank. Many tanks have natural sources beneath that are invariably believed to spring from the Ganges itself. The oldest ones, along with ancient step wells, were built to sustain entire populations, and led to the demise of empires when their supply systems failed. The holiest of Hindu shrines are almost always situated on the banks of even holier rivers. Each (river) worshipped in a divine feminine incarnation. The point of confluence of any three rivers is believed to be the most sacred of all, where some of the super sacred Kumbh festivals are held, and where most Hindus wish their ashes consigned. India boasts many magnificent rivers, but the Ganges rules high in the river pantheon in its sin washing capabilities. Tiny sealed copper pots of Ganga water were ever present in my childhood home, to be used in the event of someone’s sudden passing. It would be mixed with fresh well water and holy basil leaves and poured into the deceased person’s mouth. I remember my curiosity about its shelf life, and being berated by my grandmother for questioning the purity of Ganga water. 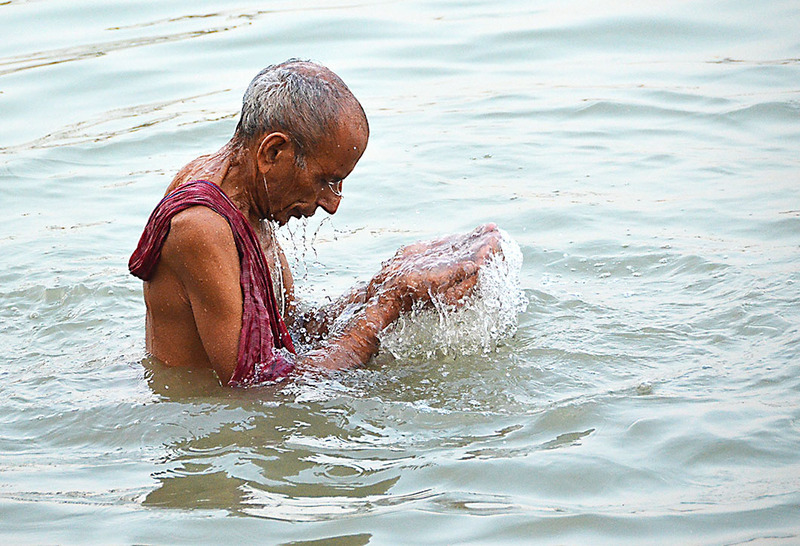 I believed her implicitly until I laid eyes on the defiled body of Ganga in Varanasi. There is no better place than a major river ghat – the steps leading down to the water level – for the inveterate people watcher. Take this scene from one of the ghats of the Hoogly (a tributary of the Ganges that flows through Kolkata) near Dakshineshwar, just outside the city. You have the devout worshipper, the mobile phone addict, the selfie poser…..and the people watcher. What grabs my attention in this fascinating evening tableau however, is the group of children in the forefront. They are fishing for coins with magnets attached to strings! And in plain view of those that made the coin offerings in the first place! That is enterprise. And it is that, not the devotion or the ritual, that intrigues me and gives me hope. Beautiful pictures and really interesting post. Perfect for the WPC h2o! this is lovely post madhu! Looking forward for more such interesting post. Thank you for reading Arv. Have a great Sunday! Heartening to see your fine and interesting posts as always. Thank you very much Stephen, I kind of lost my muse along the way. I am sure that was spectacular Toni. Would love to visit all the major Rajasthan and Gujurat stepwells someday. 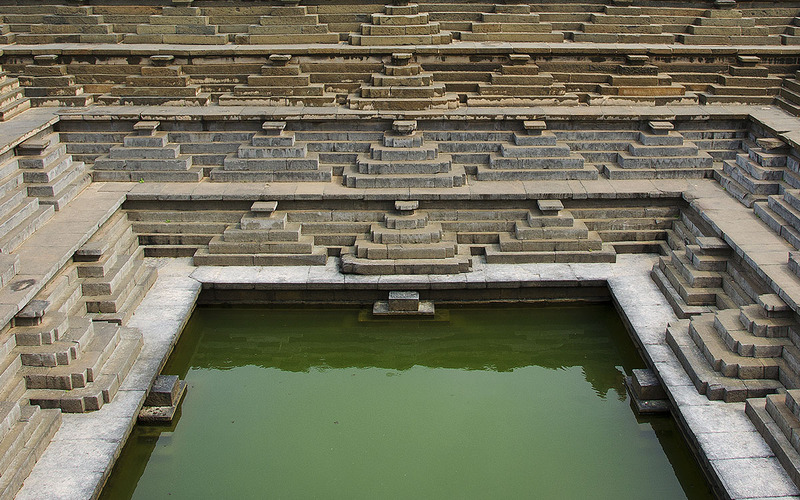 Have linked above to my post on the humbler stepwells in Delhi. These are all wonderful, Madhu, and make me want to be there! I am glad to hear your father-in-law is recovering, and happy to see your post. Sending you good thoughts for all that has been calling you away. The opening photo is quite wonderful Madhu. And also the one of Kapaleeswarar. This is a wonderful post. Varanasi remains one of our favourite places in India, not least because of the goings-on in the river and the people-watching it afforded us. Truly people are quite wondrously spectacular in their uniqueness, and the characters we saw in Varanasi almost defied description. There is something about water that’s so inescapable in all of us. I remember writing about the Ganga as part of my posts on Varanasi, and recently wrote about the power of water as part of one of my posts about the Nile. It’s potency, both literal and psychological, is undeniable. Welcome back! Shall be sure to read your post on the Ganga at leisure. I failed to connect with Varanasi, probably because its exoticism was lost on me. Shall have to give it another chance. I do think my posts on Varanasi are some of the best, but then I’m a tourist, who’s always thrilled by the exotic, so no doubt I see it all differently. Oh I just so love your post, Madhu. Since my trip beginning of this year, I just so fell in love with India. It feels like home to me. Great to hear that you enjoyed India so much Cornelia! Look forward to reading all about your trip. PS: Why does your blog link look like it has expired? Lovely pics. . Reminds me when I visited the ghat …I am sorry to say I did not have the guts to get in the water.. but sacred it is .. and it’s this faith of millions that is keeping it all.alive.. and also it is this faith that sometimes does work too in cleansing..
My wishes for your father in law.. get well soon.. take care mam..
And good to see you back…. Thank you Bikramjit, appreciate your good wishes. Yes, faith can work wonders, but I cannot quite comprehend the blind faith that defiles the very thing it venerates. I missed you. I’m glad you’re back and that your father-in-law is recovering. I hope everything else is recovering too. I love your Indian posts because they show me the splendours of a country I’ll never visit. Your photos are wonderfully sharp and clear, and your commentary informative. I’ve never seen images of the step wells. Your last photo is a great contrast to the others: holiness on hold! May all be well in your world. This was so interesting and i loved the pictures! Lovely pics of our beautiful temples and their tanks, Friend. This is one instance, however, dearest Madhu, when I am forced to also bring up the pollution, corpses and the pathetic Widow’s Ghat of the Ganges, with no offense to devotees. In this regard, it’s worth watching Mira Nair’s beautiful movie, ‘Water’ that exposes the dark side of the Ganges. Thank you Ashu. Agree with you about Mira Nair’s movie. Our respect for our rivers is symbolic at best 😦 In case you missed it, I do make specific reference to the ‘defiled body of the Ganga’ above, and have linked it to my post on Varanasi. Wonderful to have you back, thanks for your interpretation of this aspect of Indian culture and life. Madhu it’s lovely to see you, glad things have turned a corner. So are the tanks called Pushkarini because Pushkar was the first to have one? I’ve heard that Hampi is lovely, it looks peaceful. 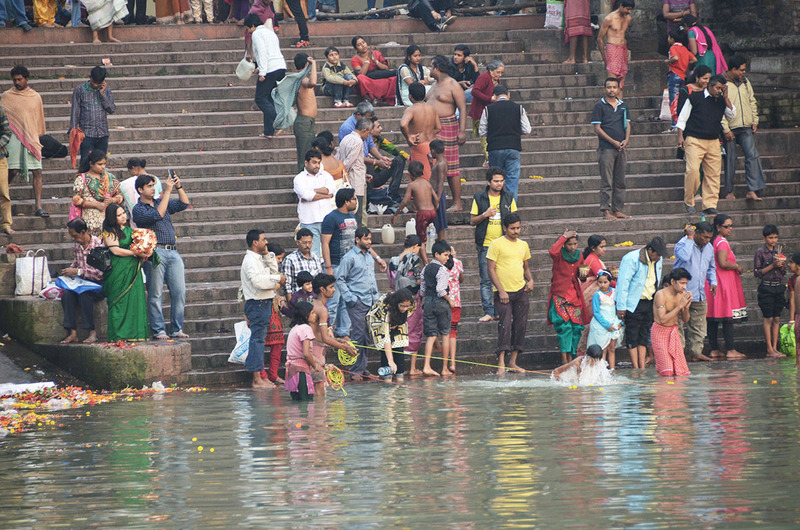 If I went to the Ganges I’d have to just people watch, it looks like a serious health hazard to me! So happy you’re back! Beautiful post. In many local beliefs in Indonesia the confluence of three rivers is believed to be a place of high energy, both positive and negative. Those who believe the former build temples, and those who believe the latter create scary stories to keep people away. Welcome back, Madhu! And I’m really glad to know that your father-in-law is recovering. How interesting, all major religions give significance to water as a purifying agent physically and spiritually. Wonderful pictures again Madhu. I have been fascinated by the rich and diverse traditions of India since youth. Your story contributes a greater understanding of it’s amazing culture. Thank you for this very interesting and delightful story of death and life along India’s sacred rivers. That is fascinating about the Ganges water and basil being poured into the deceased’s mouth. Customs like this fascinate me. I’m a people-watcher like you and think I could spend the entire day watching people on the steps leading to the river. Great to have you back Madhu. I love people watching and I can just imagine the sights and sounds at the ghat and those coin-fishing kids. Lovely insight into the Hindu religion too. Madhu, it’s wonderful to see you posting again – there is absolutely no need to apologise to any of us. I’m relieved to hear that your father-in-law is on the mend and things are looking up. I particularly enjoyed your concise and almost lyrical explanations about the significance of water in Hinduism. And of course the mention of the mobile phone addict and selfie poser in that last shot brought a smile to my face – some things are truly universal! Wonderful photos and most importantly I hope your father in-law is doing well? It sounds like you’ve had a rough ride these past weeks, Madhu. The various aspects of religious observation are fascinating until you’re personally involved. The photos are hauntingly beautiful. Sharing sadness with you. Beautifully written and photographed. You write the way I aspire to. Beautifully depicted. Pushkarini – I will remember that! I really liked this post. I liked the flow of your narration, specifically. It started with the water being the integral part of survival, its holiness and what it has been reduced to, in today’s world. 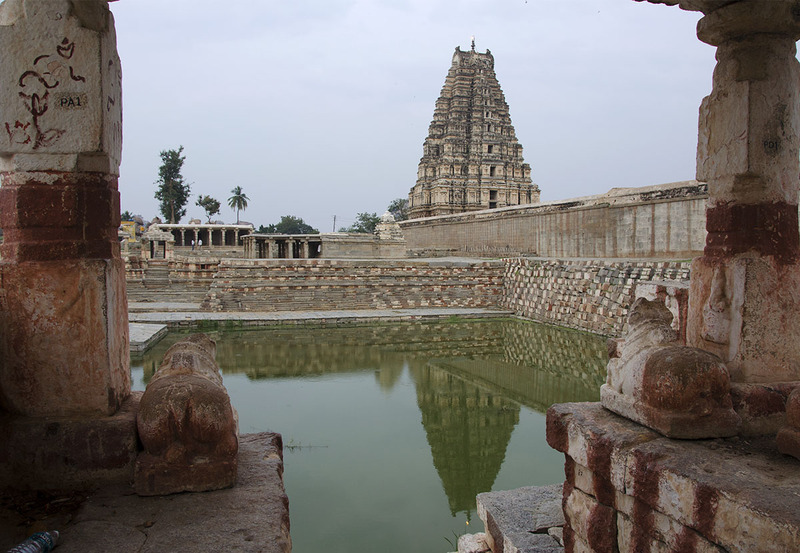 Hampi, holds a very sacred place for us, my husband and I. Its vastness and the history gives me goose bumps. I immensely enjoyed reading your post. nice article…have been to humpy once and really loved the peaceful environment and monuments & sculptures over there.